Popped down to the Royal Mail Offices today to pick up my parcel, and this was inside. It’s HUGE! 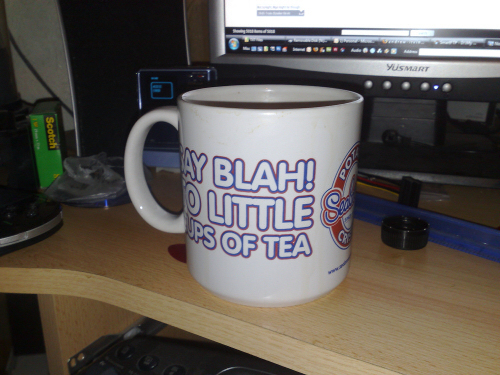 Apparrently it holds a pint and I’ve already had a cup of tea in it. It’s a meal in itself! And I took lots of photos with my new N95!! I didn’t bother taking the HP digital camera with me because I wanted to see how the N95 would cope with the different kinds of photos I’d be taking. I remember last years trip with the N70, and the year before that with the 6600, and they performed rather well. I haven’t asked the others yet but if they’re ok with it, I’ll post some photos in the galleries. Keep your eyes peeled!